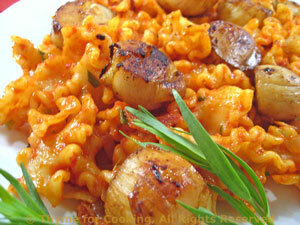 Scallops with Tarragon Tomato Pasta, Thyme for Cooking easy gourmet dinner. Seared scallops nestled on a bed of tomato and tarragon flavored pasta.... a melding of summer and fall flavors. Use the rest of the tomato sauce in the barbecue sauce tomorrow. 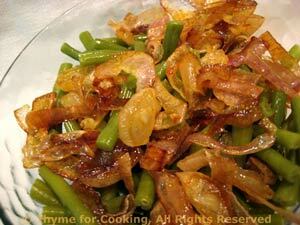 Crispy, fried shallots top these green beans, slightly reminiscent of a retro American Green Bean Casserole, but much healthier. I let them caramelize naturally, no added sugars to help. Simple summer flavors. Heat oil in medium nonstick skillet over medium-high heat. Add shallots and sauté until tender, about 5 minutes. Turn heat down to medium and continue cooking until nicely brown and starting to caramelize, about 15 minutes longer. Put beans and stock in a small skillet or saucepan Cover and cook over medium heat just until beans are done, 10 - 15 minutes. Drain, top with shallots and serve.